From elegant townhouses in history-filled Philadelphia, to a gracious home in the Main Line suburbs, to luxurious manor homes or Victorian inns in the Brandywine Valley, York, and Valley Forge, to farms or inns in Lancaster or Bucks County, A Bed & Breakfast Connection of Philadelphia offers a wide variety of styles and locations in its scores of inspected homes, guesthouses and inns. Our accommodations range in price from $60 to $250 per night. 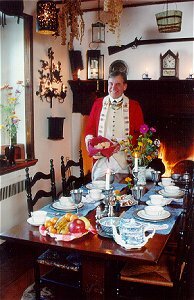 We offer houses with one guest room and inns with many rooms in seven counties in the southeastern corner of Pennsylvania. You may request a free brochure of our listings by calling 1-800-448-3619. Member of TNN. This and other Philadelphia Bed and Breakfast Inns can be found here in The Register.